An "inspiring" alphabet book has been praised by the Isle of Man Arts Council for promoting Manx heritage in a "unique way". 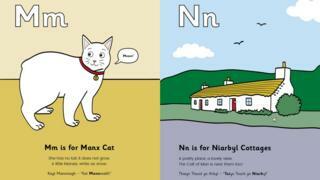 Gemma Hjerth's M is for Manx Cat! features rhymes and games and includes Manx Gaelic translations. The 38-year-old author said she produced it after being "surprised and frustrated" not to be able to find one about the island's heritage. The arts council said it "supported the key ambitions" of its arts strategy. Arts development manager Jane Corkill said the book "embraces art, song, and poetry as well as promoting the Isle of Man in a unique way, particularly to a younger audience". The book features items associated with the island, including Loughtan sheep, kippers and a Manx cat, and historic locations like Castle Rushen and Tynwald Hill. However, the Ramsey author said she had to get "creative" and use "zZZEEOOowm", signifying the sound of a TT motorbike, when finding a word for the letter z, as it is not part of the Manx Gaelic alphabet. She added that some of the other words were inspired by her own childhood. "I could see the Albert Tower from my bedroom window... and my first pet was a deaf, white Manx cat called Alice," she said.